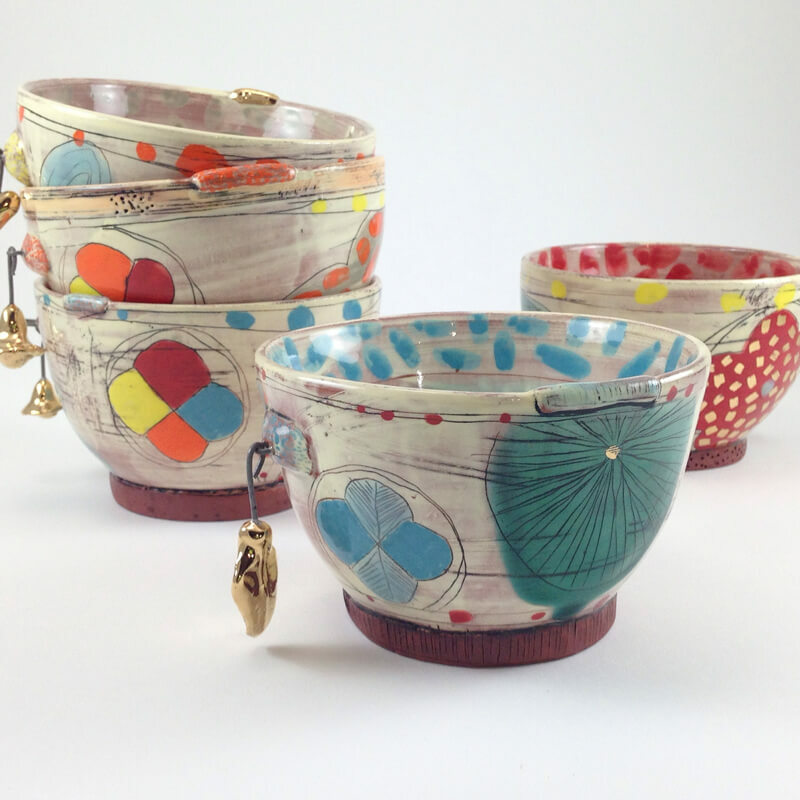 My earthenware pots are both sparse and embellished. Structurally my dishes are very straightforward, yet the surfaces tend towards bold, graphic and at times peculiar ornamentation. I revel in this dualism by collecting, arranging and garnishing; then organizing, simplifying and editing both my forms and surface. I pluck joyous observations from my surroundings. I reassemble and reimagine these investigations, like sketches in a sketchbook, onto functional dishes—a format which has the unique ability to hold a warm sentimental place in our lives. I don’t have any illusions that my pots are used on a daily basis. I have always been a fashion before function kind of gal. I think of my dishes as the platform shoes of pottery— they are party pots with utilitarian concerns. I make pots to bring joy to others’ lives. It is a true gift. Kari Radasch was born and raised in coastal Maine. She received her BFA from the Maine College of Art in Portland, Maine, and her MFA from the University of Nebraska- Lincoln. She has been a resident at the IWCAT program in Tokoname Japan, and Watershed Center for Ceramic Arts. She was an Emerging Artist at the 2004 NCECA in Indianapolis and a demonstrator at the 2010 NCECA in Philadelphia. She was the first potter awarded the Evelyn Shapiro Fellowship at The Clay Studio in Philly. Kari has been a Lecturer in Art and Visual Culture at Bates College, a presenter at Utilitarian Clay V and taught workshops and been a visiting artist at Art Centers and Universities around the Country. Kari currently teaches adjunct at Southern Maine Community College in Portland, Maine. She lives and pots in Westbrook, Maine with her husband Ian Anderson, daughter Ruby May, son Heilo Blue and their dog Max.